Ok so first lets start by addressing, is it Donut or Doughnut? 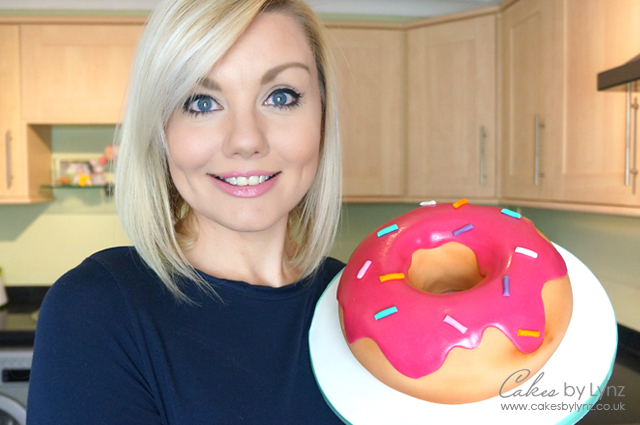 Google says its Doughnut in the UK and Donut in the US, but lets be honest it really doesn’t matter how you spell it, who doesn’t love this fried doughy dessert, so where ever in the world you are for this weeks video I really wanted to create a fun cake, and what is more fun than a giant Donut! In this video I show you step by step exactly how I made this cake. The cake is an 8 inch vanilla sponge cake filled with bright pink vanilla buttercream. 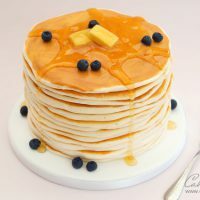 The cake can be made any size you want, so if you want to make it larger just size everything up. 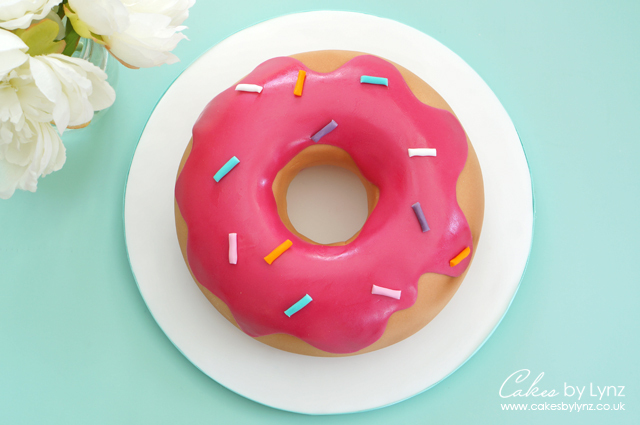 I absolutely love the colours in this cake, from the ivory donut colour to the bright pink icing ontop, which is made to look like a glaze. I finished the glaze off with some Squires confectioners glaze to make the finish slightly wet looking, which really brings the cake alive as the light hits it, and gives it a very realistic look. 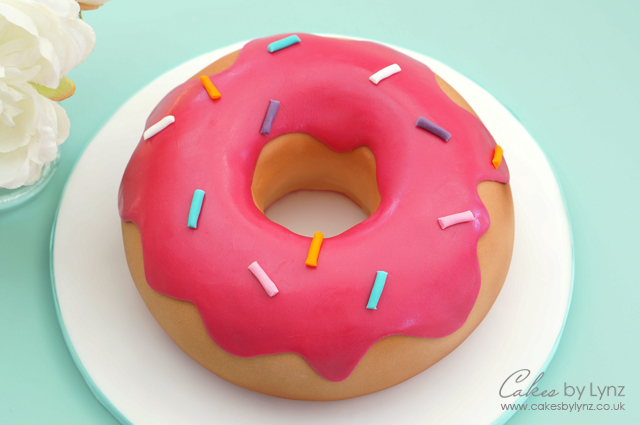 One of my favourite steps when making this cake was airbrushing around the edge to give the donut a fried look. If you don’t have an airbrush that is absolutely fine, you can use some edible dusts to just add a darker shade at the top and bottom, leaving a lighter band around the center. Ok so here is a photo of me holding the cake just to give you an idea of the size! its quite alot larger than a regular donut. I really hope you enjoy this video tutorial and find it useful if you want to make your own giant donut.